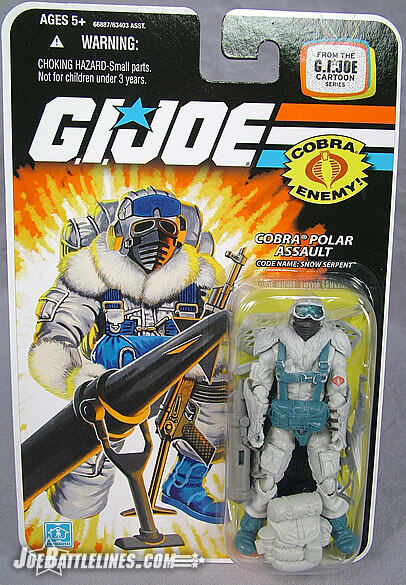 As a child, I was never a fan of the arctic troops. I grew up in Central Illinois where the dry billowy blowing snow was more of a rarity and the heavy wet snow seemed to predominate. Our winters had a decent amount of snow but we also had a fair amount of the season with nothing on the ground. 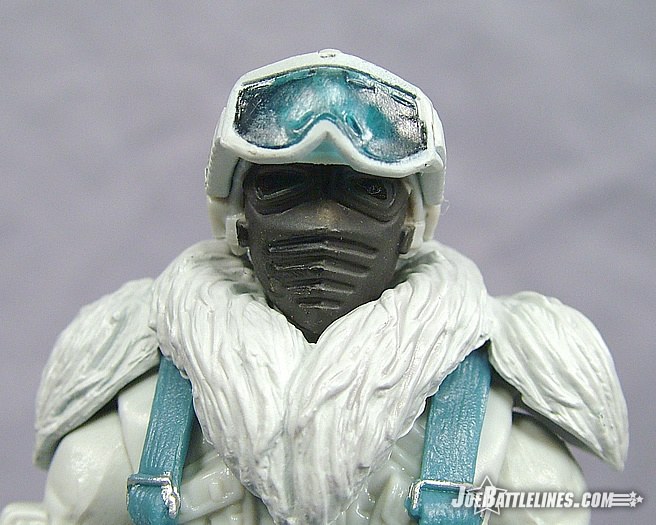 So, as a child my Hoth Star Wars figures and my cold weather Joes just never saw that much use. After all, I couldn’t exactly take Snow Job on a mission to the desert or the jungle now could I? 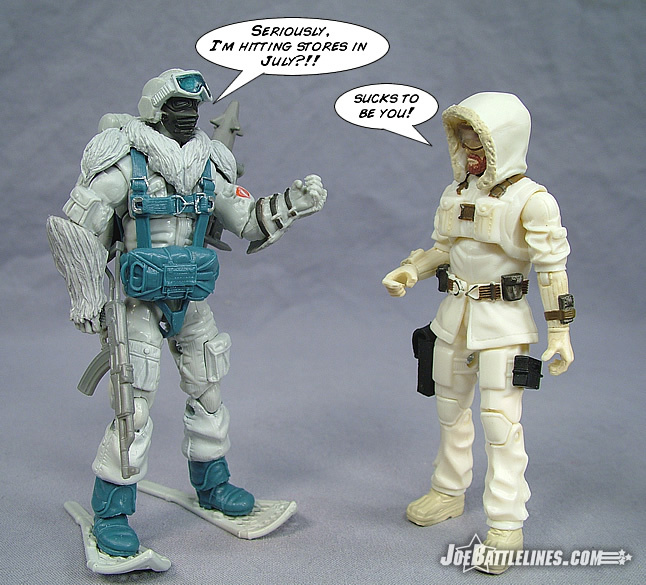 Yet as I grew older I began to gain a new appreciation for the sheer amount of detail found on some of the cold weather specialists in both GIJoe and Cobra. These guys were loaded with gear and some pretty intricate detailing that just made them visually appealing. Granted, their play value was limited as they were extremely mission-specific but as an adult collector I was more interested in the aesthetics of the design. 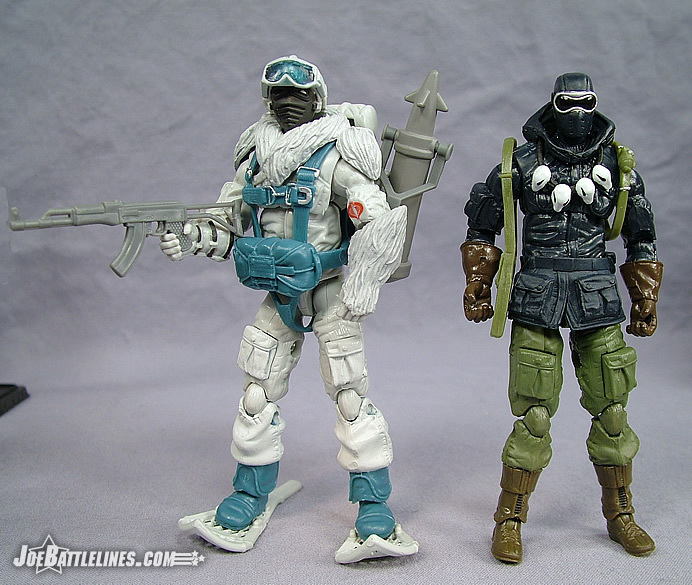 When first Snow Job and then Arctic Commando Snake Eyes were released in the 25A line it was only a matter of time before the Snow Serpent followed suit. Trust me, this figure does not disappoint. When it comes to gear, the Snow Serpent is certainly well-equipped. 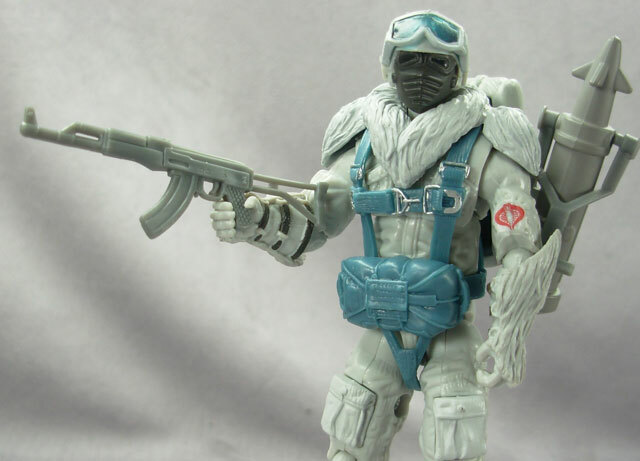 Complete with backpack, anti-armor rocket, AK-47, and snow shoes this is one of the most heavily “geared up” figures in the new “no-ring” line. (In fact there so much bulky equipment included that the figure looks positively crammed into the package with everything.) 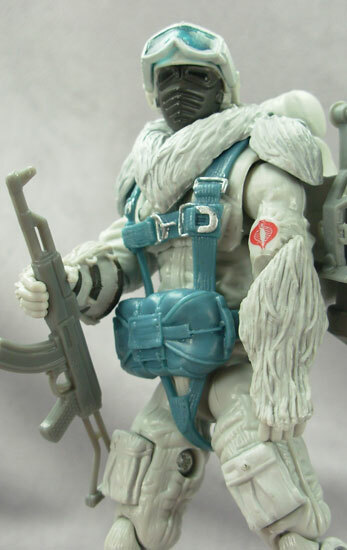 It’s a nice homage to the kit of the original figure which also featured realistic practical gear. 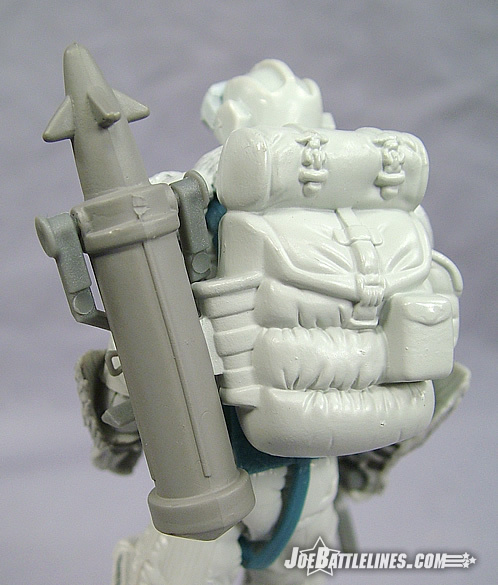 The ability to stow the anti-armor device on the backpack is a real plus even though it doesn’t sit as solidly as Bazooka’s rocket does on his pack. 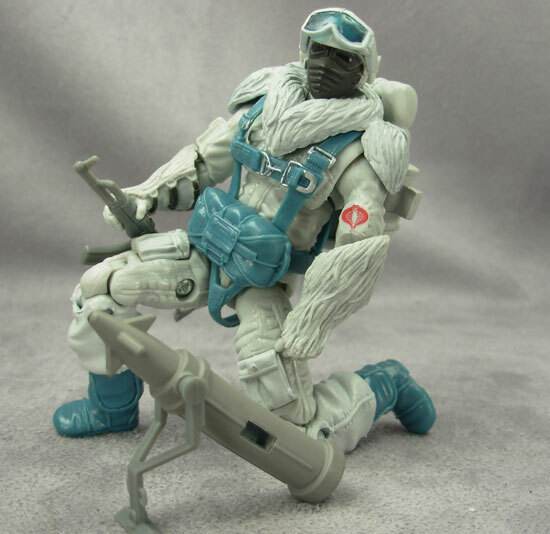 Much like the Arctic Commando version of Snake Eyes, the Snow Serpent’s snow shoes the ability to remain on the figure’s feet even if the display stand is used thanks to a second set of holes. While the shoes themselves are molded from a rubbery plastic and are prone to warping in the package the ability to use them with or without the included stand is nice piece of design foresight. (To paraphrase BA Baraccus from “The A-Team”: when Hasbro’s on the jazz, they’re on the jazz.) One more detail of this figure that needs to be mentioned is the pair of thick goggles perched on the figure’s forehead. They’re not removable but they are molded in translucent blue plastic which adds a further dash of realism to the overall appearance of the figure. I do wish the helmet was removable as was the case with the DTC and later VvV versions but doing so would most likely add unnecessary bulk to the figure’s head and shoulders. Besides, as collectors we can’t have everything, right? In closing, I’m more impressed with this figure than I thought I would be. I’ll be honest—I’m not one of those collectors who is running out and troop-building this new line in large numbers. Given the relative scarcity of product on retail store shelves and the increased cost of the figures, it’s just not in the cards for me. Besides, I did my troop building a few years ago during the “new sculpt” GvC era and just don’t feel like starting over again. However, I can appreciate the quality of the product that is the Snow Serpent. He’s loaded with detail, possesses functional and useful articulation, and is a terrific update of a classic design. All-in-all, this is one of the stronger troop-builders in this 25A era line and serves as yet another example of just how solid a product Hasbro can produce when they’re got their A-game on. (Oh poor little Viper… how insignificant you must feel right now.) Yet again I find myself recommending another “no-ring” Joe to collectors simply because the quality of the product in this case is so high. 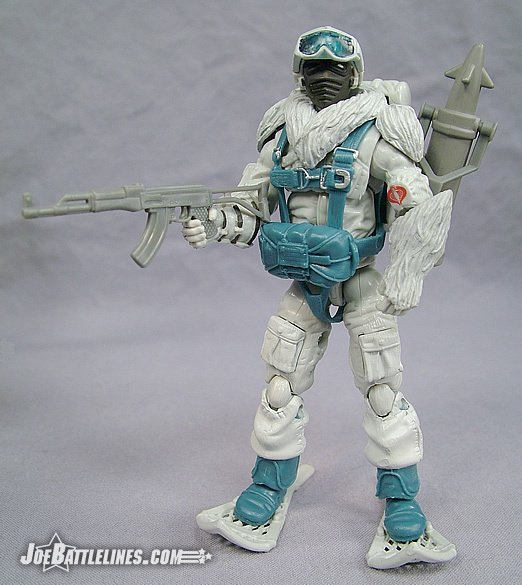 I’m still not a huge fan of cold weather troops and I’m thoroughly impressed with this one.